U.S. Census Indianapolis, Marion County, IN 1900: "Jane Ivy Finley [Fendley], age 52 b. Mar 1848 Indiana, father b. Kentucky mother b. Ireland, m. 1874, eight children b. Indiana, six living: Benjamin age 21 b. Mar 1879 day laborer, Henry 19 b. Nov 1880 day laborer, Nelly 17 b. Nov 1882, Albert 9 b. Dec 1890 day laborer." U.S. Census Ward 14, Indianapolis, Marion County, IN 1920: "Ivy J. Fendley, age 70 b. Abt. 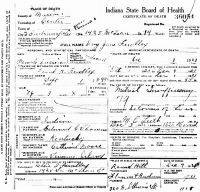 1850 Indiana, father b. Kentucky mother b. Ireland speaks Irish, widow; two children b. Indiana: Albert, age 31 b. Abt. 1889 Indiana, widower, helper-stock yards, Nellie, age 32 b. Abt. 1888 Indiana, single, ironer-laundry." Born - Mar 1848 - Indiana, U.S.A.
Died - 1 Dec 1921 - Center, Marion County, Indiana, U.S.A.